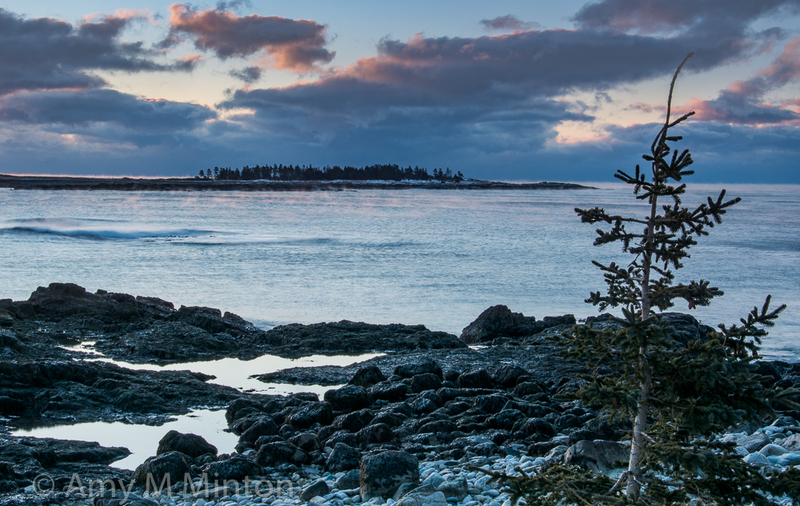 Amy Minton was one of three students on the “Winter in Acadia: A Creative Photography Retreat” held on the scenic Schoodic Peninsula in Acadia National Park, Maine, from February 7-13, 2016. This blog post features her thoughts and images from her experience. If you have enjoyed seeing Acadia through her eyes, please leave her a comment on her post! More of Amy’s work can be viewed on her website at www.amymintonphotography.com. Winter is a beautiful time of the year and offers many opportunities for outdoor photo shoots. My camera, however, hibernates in winter. Well, at least that was the case before I participated in Colleen’s workshop, “Winter in Acadia: A Creative Photography Retreat,” this past February. By the end of the workshop, I was very happy that I took my camera out of hibernation and returned to Acadia National Park. Now, not only do I possess confidence to shoot outdoors in winter (and in fact have done so – post-workshop), but also I learned about the creative process and its influence on my photography as well as history, geology, and wildlife within and around Acadia National Park. Face of Otter Cliff. I usually don’t think of a title for an image when at a location, but while at Boulder Beach (Acadia National Park, Mount Desert Island) the snow and ice coating the rocks at Otter Cliff appeared to reveal a face. At time, I wondered if it was only during the winter season that the face is exposed. If so, then add it to one more experience of the unique beauty of Acadia National Park in winter. 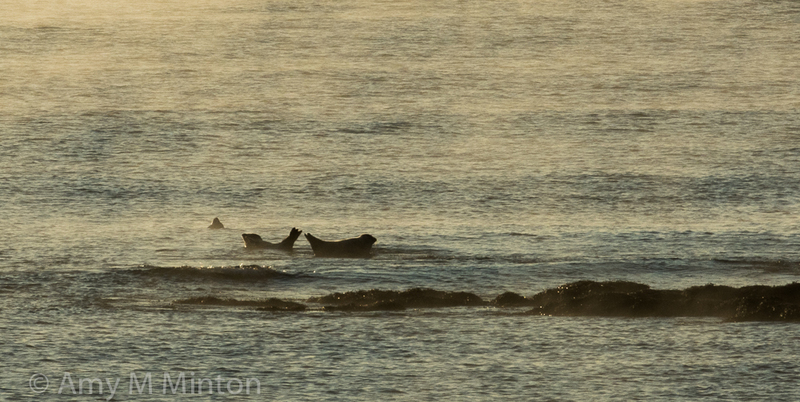 The harbor seals in this image were spotted resting, presumably on a rocky outcropping exposed at low tide, in Wonsquak Harbor. I am sharing this image because it represents one of the many forms of wildlife that was seen during my photo adventure. In addition to the harbor seals, I watched a seagull drop, while in flight, drop a mussel onto the road in order to crack the protective shell, and then, gain access to the mussel inside (I had never seen that before). There were also a variety of mammal and bird tracks in the snow, but the “coolest” tracks, in my opinion, were the river otter tracks. Despite not actually seeing the river otter(s) (unlike the workshop participants the week before my group), I thought it was amazing to see the paw prints in the snow and then see where the otter slid on it’s belly on top of the snow. It still makes me smile when I think about that river otter running along the snow and then sliding on its belly before he reached the waters edge and began to forage for food. I suspect the river otter made a game of it along his way. 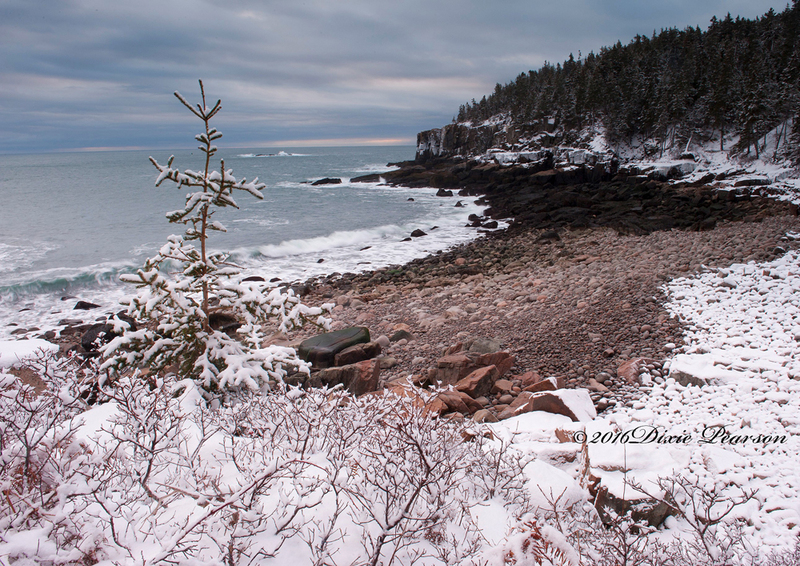 Would you like to experience and photograph Acadia in the winter while learning how to express yourself more creatively? 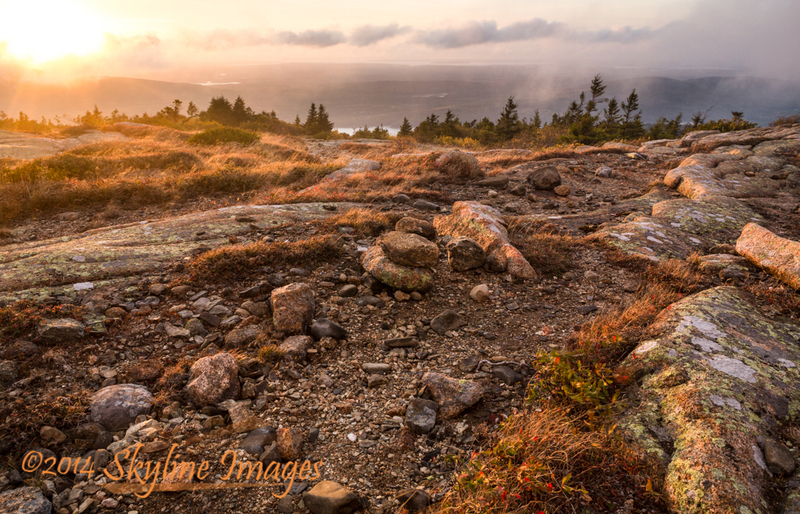 Join Colleen on her next “Winter in Acadia: A Creative Photography Retreat” from February 12-18, 2017! Learn more and register for this unforgettable, small group (max 6) workshop at cms-photo.com/Workshops/2017WinterinAcadia.html. 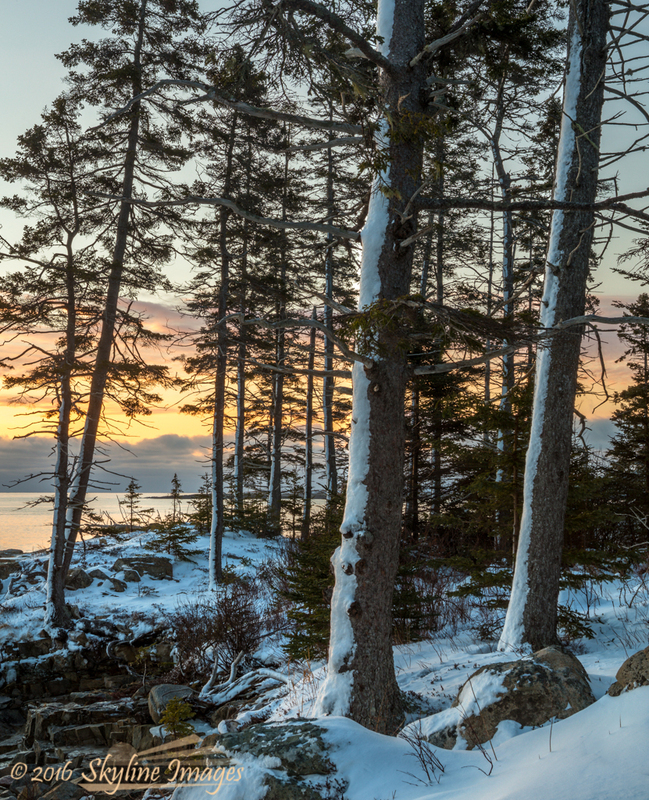 Dixie Pearson was one of three students on the “Winter in Acadia: A Creative Photography Retreat” held on the scenic Schoodic Peninsula in Acadia National Park, Maine, from February 7-13, 2016. This blog post features her thoughts and images from her experience. If you have enjoyed seeing Acadia through her eyes, please leave her a comment on her post! More of Dixie’s work can be viewed on her website at dixiegirl.smugmug.com. Winter in Acadia gave me the opportunity to be truly alone with the landscape. Through Colleen’s excellent guidance, I was able to “turn off” my thoughts, and listen to my surroundings. 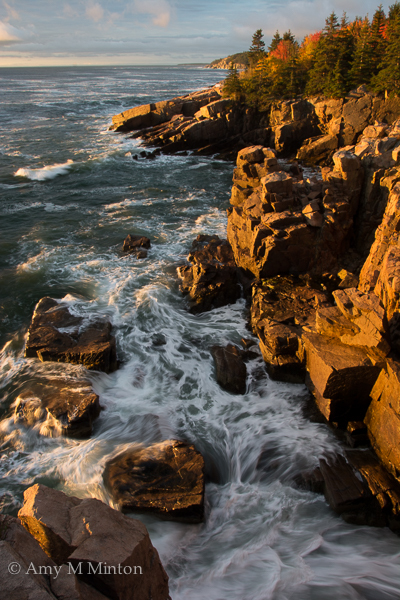 The crashing of the waves and the whistling of the wind during our first day of shooting at Schoodic Point. 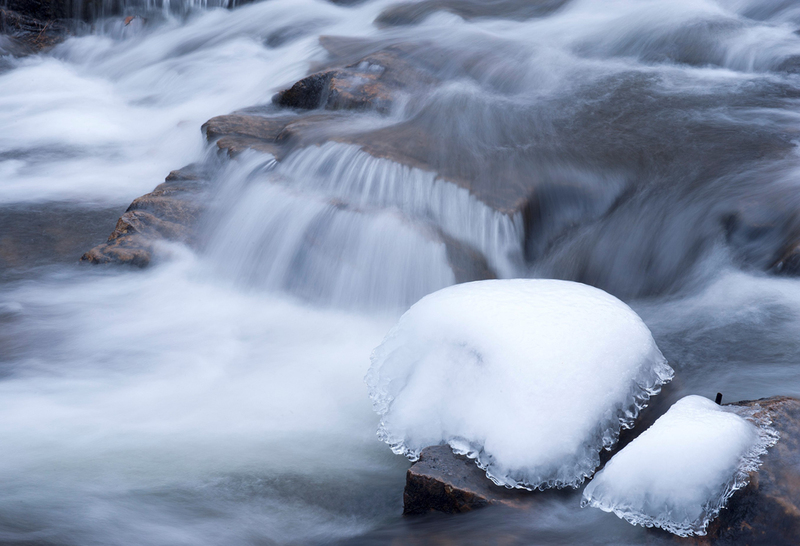 The snow and ice forming “ice pillows” over rocks at Duck Brook. 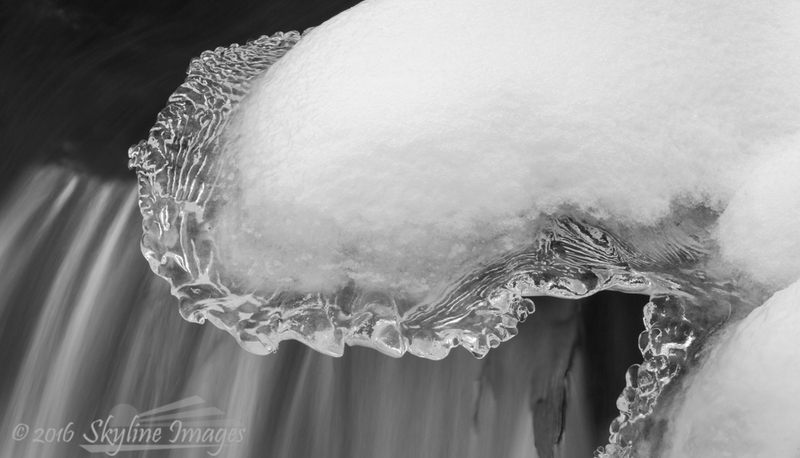 The myriad ice formations, rising and breaking around us at West Pond Cove. The sound of the pebbles, like tiny bamboo xylophones, tumbling in the surf as each wave recedes at Boulder Beach. What an incredible opportunity it was to capture such an amazing place in winter. I can truly say that it was well worth braving the elements~just dress warmly and enjoy! 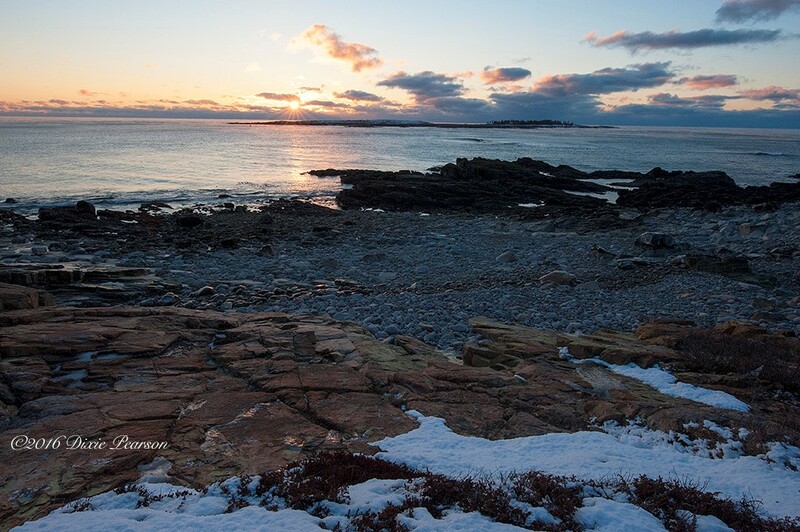 Rebecca Wilks was one of three students on the “Winter in Acadia: A Creative Photography Retreat” held on the scenic Schoodic Peninsula in Acadia National Park, Maine, from February 7-13, 2016. This blog post features her thoughts and images from her experience. If you have enjoyed seeing Acadia through her eyes, please leave her a comment on her post! More of Rebecca’s work can be viewed on her website www.skylineimages.net and her blog at theviewfromtheskyline.blogspot.com. Another fabulous workshop with Colleen Miniuk-Sperry has come to an end too soon. 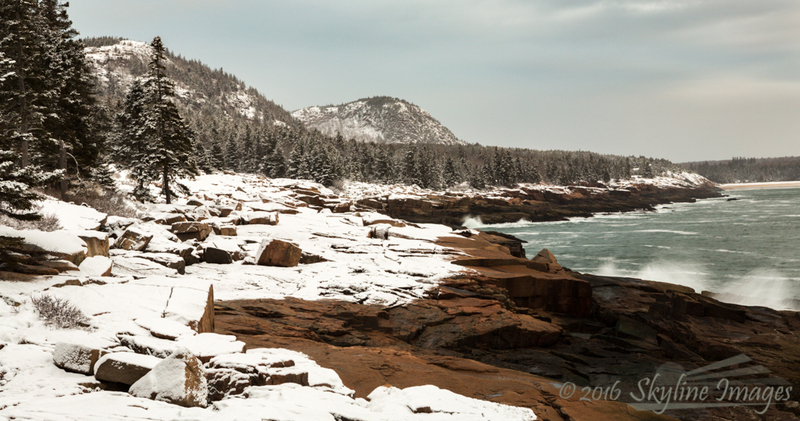 I’d been to (and Around) Acadia National Park with her twice before, but never in the winter. Of course our little group knew we couldn’t predict what the weather would bring in February for safe travels or for photography. We were fortunate. Temps were well above freezing the week before and after our time there, but we saw wind chill temps below minus 20. Yes, we were slow-moving, sometimes uncomfortable and occasionally whiny. We were fortunate though, since the colder temps are much more conducive to photographing snow and ice, which we did with joy. Colleen has asked each of us to contribute a few favorite images with our thoughts. One morning along East Schoodic Drive I was following the trail of a fox in the deep snow. I looked up and was struck by the graphic quality of evergreen trees with ice plastered to their trunks on one side. As Colleen often encourages students to do, I pondered what attracted me to the scene. There’s a literal narrative here about the strength of the storm the night before, but also universal truths about perseverance and the fresh start that comes with the dawn. Oh, and I think it’s pretty. We drove twice to Mount Desert Island, where the larger and more visited (though not so much in the winter) part of the park lies. My favorite shots there were at Duck Brook, where fanciful ice formations resembling pillows, chandeliers, and sea creatures had formed above a retreating flood. The texture of the ice fascinates me still. Somehow on this trip, I often found myself shooting in the opposite direction from my friends. Here’s an example along Park Loop Road. They were making lovely images of a snow-covered Boulder Beach, but I was captivated by the coast in the other direction with their curves echoed by the high tide line and mountains as well as the sense of power in the waves. I can’t wait for a chance to do it again. 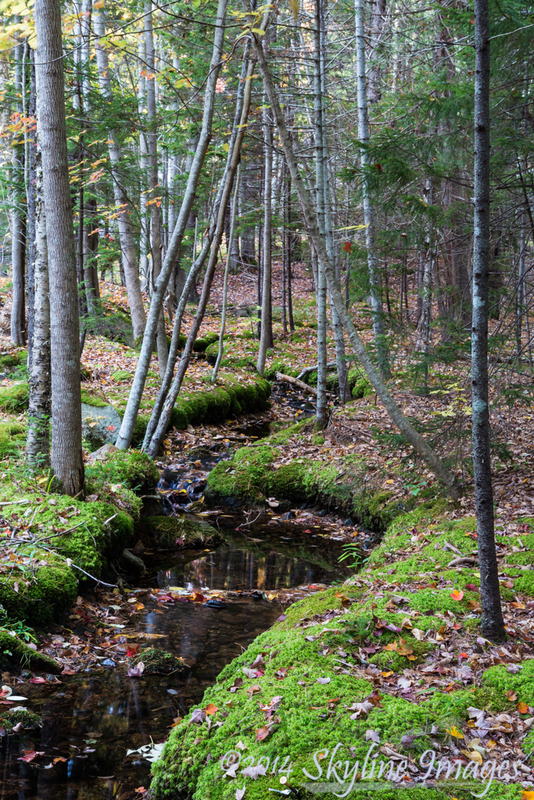 Rebecca Wilks was one of four students on a private CMS Photography workshop to Acadia National Park held in mid-October 2014. This blog post features her thoughts and images from her experience. I hope you enjoy, as I so very much have, seeing Acadia through her eyes (and if you do, please leave her a comment on her post!). More of her work can be viewed on her website www.skylineimages.net and her blog at theviewfromtheskyline.blogspot.com. I didn’t know what I was missing. Last year, that is, when Colleen valiantly invented a workshop “around” Acadia National park because the government had shut down and the park was closed. It’s just as well, because I would have been terribly disappointed if I had known what I know now. Acadia is a really special place. From the historic carriage roads with their stone bridges to the classic rocky Maine coastline, I’m hooked. I’ve rarely had as delightful a group of traveling companions, as well. I’m looking forward as only a naive Arizona girl can to a trip in winter 2016. Sometimes I’ll be intrigued by something other than the main attraction. We’d stopped to shoot a bridge and Stanley Brook called to me from the forest. I loved the repetitive s-curves and the (very different from my desert home) mossy forest. Honestly I had no idea what this image would look like, because the wind was blowing 50-60 and my eyes were watering so much that I couldn’t see anything. I may not have been the only one who was tempted to hike back to the vehicle and get off Cadillac Mountain, but Colleen the intrepid talked (shamed) us all into staying, and in the end I was pleased. The light seems otherworldly to me. That being said, we all agreed that we’d had about enough of this mountain and it didn’t make the short list of places to visit on our last two days, after Colleen had gone home. Rain and fog in its fabulous moodiness. The voice in my head wants to stay cozy in bed, but I’d so glad we got out this day. 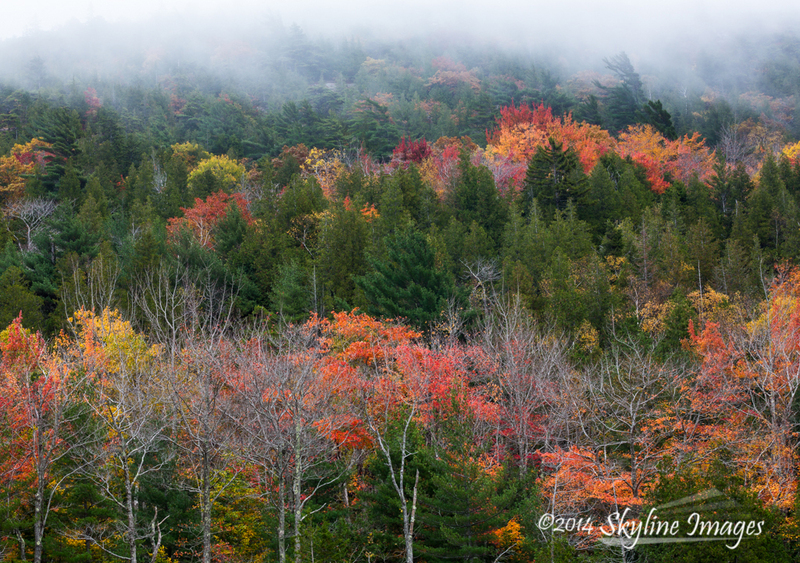 Layers, colors, fog. I loved it. I really wanted this one. We all did. We shot here mid-day and then on a densely overcast morning. We gave it yet another try on our last morning in the park and we saw this incredibly beautiful (no less so in its subtlety) treat. Ahhh. 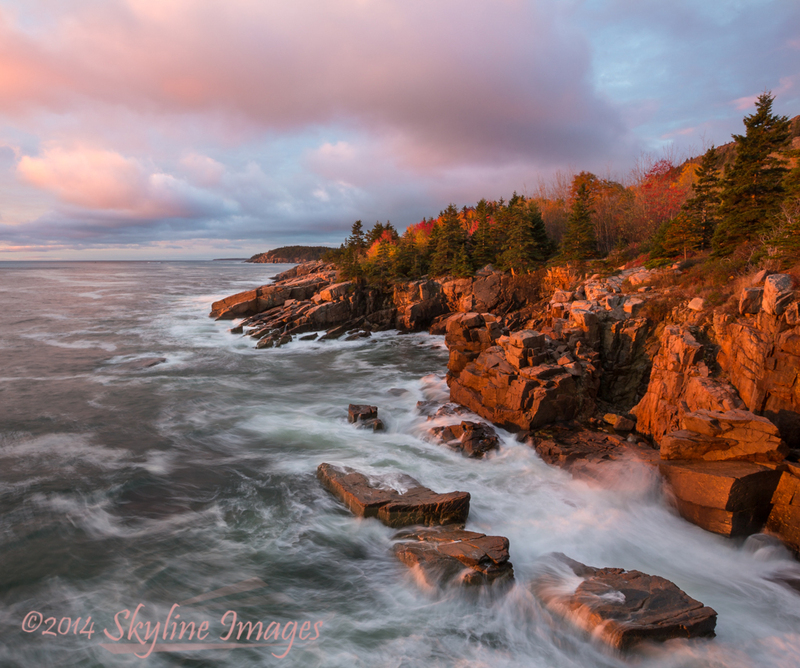 Amy Minton was one of four students on a private CMS Photography workshop to Acadia National Park held in mid-October 2014. This blog post features her thoughts and images from her experience. I hope you enjoy, as I so very much have, seeing Acadia through her eyes (and if you do, please leave her a comment on her post!). Regarding my overall experience in Acadia, it was AWESOME! Getting some nice pictures to frame or put into a book or calendar to share is a bonus to me. The real pleasure for me was experiencing Acadia National Park and doing so with others who were just as excited about seeing the park. What a great way to spend time off – learn/experience nature and photography. Some highlights from this trip include: 50 mph wind gusts atop Cadillac Mountain; sitting and listening to the water flowing down Jordan Stream after a night/morning of rain; hearing the sounds of the woods as you walk along a carriage road; enjoying popovers at the Jordan Pond House; and observing the groves in the rocks created by the glaciers or other geological marvels. Also there were plenty of photography learning experiences. For example, Colleen showed me how to bracket for exposure and I subsequently merged post-processing (see Eagle lake carriage road and bridge photo below). I learned about creating abstract images by moving my camera after releasing the shutter, and Colleen talked/showed me how to set up and take images to later merge as a panoramic photo. Additionally, she made me think and ask questions of myself as to why and how I wanted to capture what made me stop and admire a scene in nature. (1) Abstract motion blur Sieur de Monts Jesup Trial. Although I generally do not think – abstracts (no shock there), I have been intrigued by abstract motion-blur images I have seen in magazines, books, and online. Yup, I wanted to give it a try and had thought there would be an opportunity to do just that during the workshop. 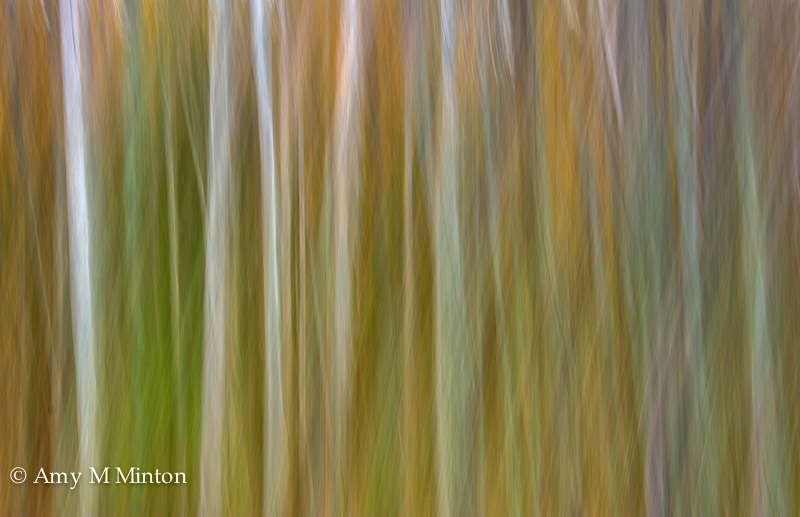 The types of trees as well as the colors from the grasses and leaves seemed to me to be screaming make an abstract image via your camera. I think it surprises folks at work as well as my family when I have shared this picture and another one (also taken from the boardwalk). (2) Eagle lake carriage road and bridge. 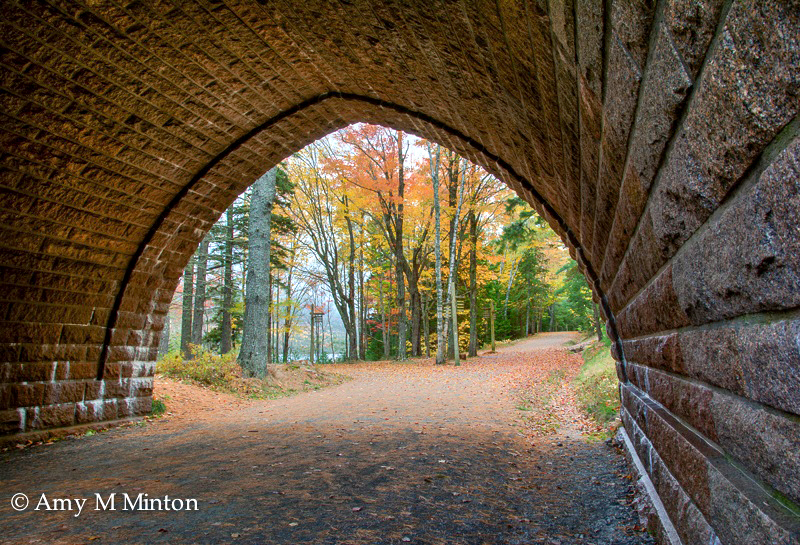 After reading about Acadia’s Carriage roads and bridges, I really was looking forward to seeing them. All the care, time, and effort that was put into creating and preserving the idea/concept of the carriage roads is rather remarkable. As I look at this picture, I am able to see JDR Jr’s concept fulfilled – people enjoying nature without the interruption of cars (road travels above the carriage road). It makes me smile and I am able to imagine myself walking along the carriage road admiring nature and being at peace. (3) Persistence pays off Newport Cove. When I look at this image, I am reminded of the effort that went into having the opportunity to make it. We scouted the location with Colleen before she headed back to Arizona (after the workshop ended), and thank goodness. I don’t think we’d have found it in the dark nor would we have as confidently negotiated the path as we did (twice). Saturday morning was beautiful in its own way – Moody Maine (possible title for my photo book) but did not live up to the promise we all knew was possible if there was good morning light. We were rewarded for our decision to return on our last day in Acadia. I have many fond memories from this trip and find myself looking back upon them and smiling. It was a fun and awesome adventure. I can definitely see why Colleen keeps going back to Acadia and wrote Photographing Acadia National Park guide book. January 2013 Print of the Month: 30% Off Prints of this Photo Thru January 31, 2013! New for 2013, we're pleased to introduce our new Print of the Month Collection! Here's how this works: Each month, I'll select one featured photograph, and for the duration of that month only, that selected photo will be available for sale at 30% OFF any size and style print! In addition to your print, you'll also receive a one-page write-up on the story behind the photograph, which will include specific location information, technical details, and photography tips. To order the print of the month, visit our new 2013 Print of the Month gallery, select that month's photo, click Add to Cart, select the size and style you desire, and then enter the coupon code provided above the photograph during the checkout process. 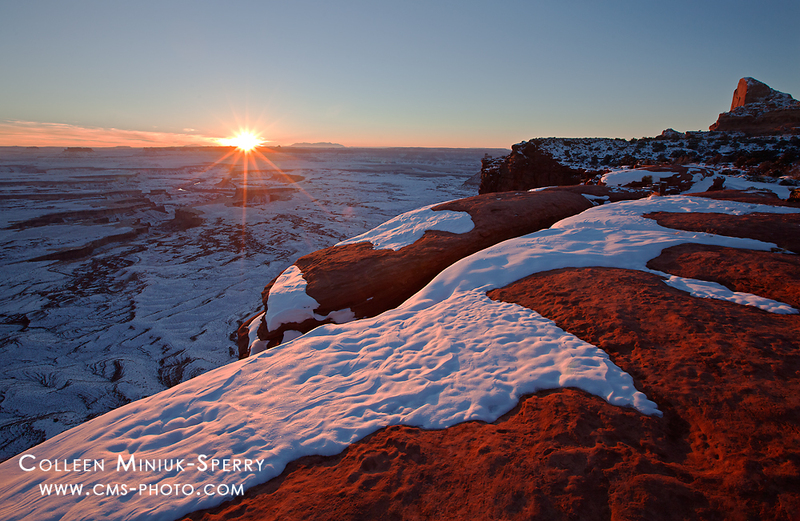 Without further ado, I'm excited to share that our most recent photograph, titled “Winter Solstice Eve” from Canyonlands National Park, Utah is CMS Photography's very first Print of the Month! Now thru January 31, 2013, if you use coupon code 13JANPOM1, you'll receive 30% off this print in any size and style!